Carter and his father Brad Prewitt at the Lindenwood men's ice hockey game on Oct. 26 at the Wentzville Ice Arena. At the start of every game for both the men’s and women’s ice hockey teams, 12-year-old Carter Prewitt waits for his favorite players to hit the ice. He leans over the railing, peeking into the hallway below, with his father close beside him. As the players emerge from the tunnel, Carter reaches out to touch a stick or grab a gloved hand before the skaters step onto the ice. He returns to that same position at the end of every period, showing support even if his team is losing. For Carter and his father, hockey is more than just a sport they enjoy watching. Carter poses for a photo while watching the men’s team play the University of Illinois on Oct. 27 at the Wentzville Ice Arena. “It’s normal, in a life that isn’t always normal, so we love this rink, and we love these teams because it gives us a chance to be a part of something that we have a huge interest in,” Brad Prewitt said. Carter is one of nearly 15,000 people living with Angelman syndrome. The rare and complex neuro-genetic disorder characteristically includes developmental delays, lack of speech, seizures and walking and balancing disorders, according to the Angelman Syndrome Foundation. While he often communicates non-verbally and uses specific signs to indicate his favorite players on the ice, including tapping his right shoulder to talk about sophomore forward Caleb Ernst, after Ernst once injured his shoulder, Carter can walk, unlike many with Angelman syndrome. Carter poses with the men’s ice hockey team after their game on Friday, Oct. 26, against the University of Illinois at the Wentzville Ice Arena. Photo by Brad Prewitt. Additionally, Carter plays for the Blues Special hockey team, meaning that he and his father sometimes spend more than five days at the ice rink. 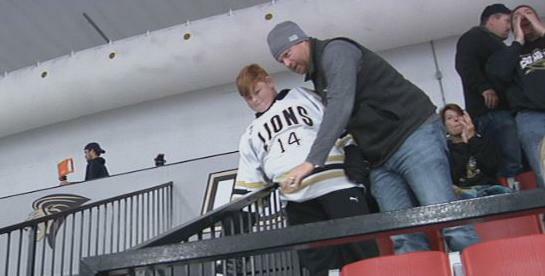 But when he’s not practicing for his own hockey games or skating at a stick and puck, Carter and his father are busy supporting the Lindenwood ice hockey programs at practices and games. For the players, Carter’s support even inspires their game.